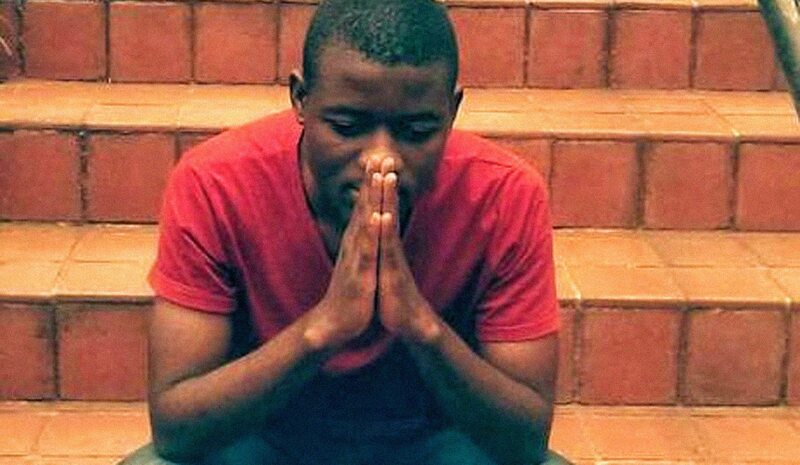 After a grilling in the Constitutional Court on Wednesday, the state finally agreed to release student and #FeesMustFall activist Bonginkosi Khanyile on bail after his arrest in September. The case was a victory for students and Khanyile’s party, the Economic Freedom Fighters, but his lengthy imprisonment highlighted the failures of the justice system. By GREG NICOLSON. Chief Justice Mogoeng Mogoeng on Wednesday said arguments in court often emphasise intellectual points of law but fail to recognise the consequences for “real human beings”. The human in question was 26-year-old Bonginkosi Khanyile. The Constitutional Court heard his urgent application for leave to appeal the decision of multiple courts and state prosecutors to deny him bail after he was arrested in September for participating in a #FeesMustFall protest in Durban. The state’s lawyers failed to explain why Khanyile should continue to be detained and after an adjournment agreed he should be released on R250 on the condition that he agrees not to intimidate university security or staff or interfere with police operations. It was an agreement that could have been reached months ago, but only after some of the country’s most prominent lawyers joined the case – and the Constitutional Court added its criticism – was the state willing to let him out of jail. Khanyile was arrested on September 27 last year on eight charges, including public violence, inciting violence, and participating in an illegal gathering, during a student demonstration. He was a Durban University of Technology student and supported action at the University of KwaZulu-Natal. Students arrested in protests are generally released the next day with specific bail conditions. University of Witwatersrand student leader Mcebo Dlamini, who was in court on Wednesday, was held for 21 days. A campaign for Khanyile’s release, led by his party, the EFF, held multiple demonstrations. Representing the state, Advocate Andy Bester on Wednesday outlined why the Durban Magistrate’s Court initially denied Khanyile bail. The decision, along with the refusal from other courts and state lawyers to budge, meant Khanyile would be kept locked up for months. He was arrested during a protest last February and, against his bail conditions, participated again in an “illegal gathering”. There was a video of him telling students to “moer” cops. He had participated in violence against police and suggested he supported burning buildings at tertiary institutions if it would help the fight for free education. He had been expelled from Mangosuthu University of Technology for participating in illegal protests. “There was a likelihood he would disturb the public order and undermine peace and security,” said Bester. “He’s willing to break the law. He’s willing to commit violence, at least against police.” But the state’s reasons for continuing to detain Khanyile, and the reasons he has been detained for six months, came under heavy criticism on Wednesday. In her judgments, Durban Magistrate Jackie Jonck failed to properly weigh up the necessary considerations in deciding on bail. She relied largely on political considerations. Mogoeng read a passage from a judgment condemning #FeesMustFall and claiming demonstrating students do not have the right to close universities and limit other students’ education, or damage property and intimidate others. She said he had only himself to blame for his incarceration. “To a significant extent he suffered the consequences of embracing the #FeesMustFall campaign?” asked the chief justice. Bester denied the claim and said the magistrate had weighed up all the relevant considerations. A key issue for the Constitutional Court justices was timing. Khanyile was arrested and initially denied bail while protests spread across the country. The situation has calmed; the SAPS investigation into his case is complete; he poses no flight risk, and has retracted his support of violent protest. Why was the state opposing bail? Advocates Dali Mpofu and Thembeka Ngcukaitobi represented Khanyile. Asked why he had been denied bail, Mpofu said, “The only ‘fact’ in this case is that this student had to be made an example of.” Explaining the “unusually over-zealous prosecution”, he noted the reported government plan, endorsed by President Jacob Zuma, for police to crack down on student protests and courts to make examples of leaders. Mogoeng ensured Mpofu didn’t take the argument further – it would be an attack on the whole judiciary. Yet it’s hard to ignore the potential political pressure the NPA might have faced. Ngcukaitobi and Mpofu argued that the magistrate failed to take into account all relevant factors in deciding to reject Khanyile’s bail application and that the Gatherings Act, under which charges were laid, had been misapplied. The advocates were repeatedly questioned on whether the Constitutional Court should be hearing the case or whether they should take it back to the Magistrate’s Court. There was a chance the court could deny their appeal because the Constitutional Court lacks jurisdiction on the matter, but the state – already embarrassed and facing a rebuke, even if the appeal was denied – decided to settle and free Khanyile on terms his lawyers were happy to accept. Khanyile’s extended imprisonment and, until Wednesday, the judiciary’s apparent failure to recognise and rectify its failures raises other legal issues on bail applications, protest regulations, and the class and racial dimensions of who has access to decent legal representation. “The system will not give you roses when you fight it. The system will fight back and you must be determined to fight forward and never retreat,” EFF leader Julius Malema was quoted as saying outside court. After funding Khanyile’s defence team, the party held a demonstration outside the court. The EFF appeared to isolate broader support from the #FeesMustFall movement, but, given the EFF’s action on the issue, it was a significant victory for the party. “We came to defend the jailing of an innocent African child. They even justified why he must be locked up without a trial,” said Malema. Behind Malema’s comments and Khanyile’s case is South Africa’s remand detainee crisis. Around 40,000 remand detainees, people who have been arrested but are denied or can’t afford bail, languish in South African jails. It’s almost one third of the prison population. Many of them spend months, if not years, waiting for a trial date, despite regulations adopted in an attempt to improve the situation. The courts and prisons aren’t forced to take responsibility for the situation, leaving remand prisoners behind bars, often in worse conditions than sentenced prisoners. If the EFF had not hired a top legal team, Khanyile would still be in jail. Geraldine Moodley, director of the Wits Justice Project, told Daily Maverick after the sentencing of Oscar Pistorius that the athlete was privileged since his arrest “in comparison with inmates we correspond with who are not wealthy, cannot find adequate representation, cannot facilitate appeals quickly. Many are often awaiting trial for up six years, as [have] one of our contacts.” Khanyile’s case could send a message to magistrates across the country, and address situations like his where the denial of bail was clearly an abuse of the system, but without high-priced lawyers it’s unlikely the system will change. The case also raises the issue of the Regulation of Gatherings Act and how the SAPS deals with protests. In 2015 the United Front, Right2Know, Marikana Support Campaign and the African Diaspora Forum announced that they wanted to reclaim citizens’ rights. The United Front’s John Appolis said they wanted to reclaim “the right to protest, the right to assemble and we have noticed that the police are being used to undermine this fundamental right to protect the ANC government, to protect the elite around these particular issues”. Cops were accused of acting for government; the organisations said the Gatherings Act limited the freedom to protest.